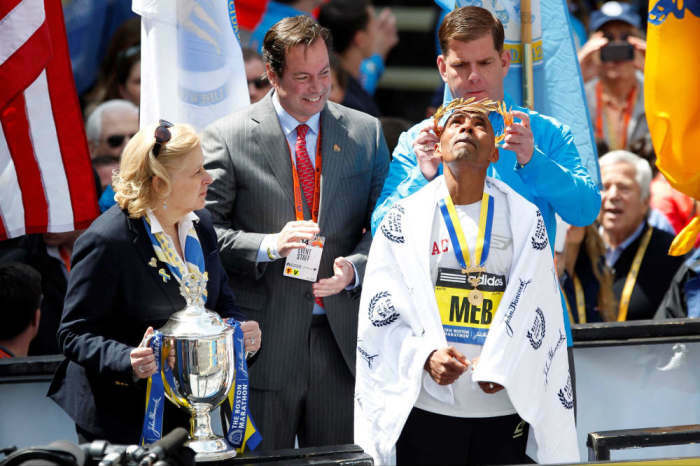 Mebrahtom "Meb" Keflezighi, the first man among more than 35,000 runners competing in Monday's Boston Marathon to cross the finish line, was also being celebrated because he is the first American to claim the top spot in more than 30 years. The Olympic medalist, who believes God called him to run, completed the 26.2-mile race ahead of other male competitors in 2 hours, 8 minutes and 37 seconds. Keflezighi achieved a similar victory in 2009 when he became the first American in 27 years to win the New York City Marathon, his first marathon victory. "Keflezighi looked over his shoulder several times over the final mile. After realizing he wouldn't be caught, he raised his sunglasses, began pumping his right fist and made the sign of the cross," reports CBS News of his victory in Boston. The publication reports that Keflezighi was the first U.S. victor since Lisa Larsen-Weidenbach, who won the women's title in 1985. The last American man to win the Boston Marathon was Greg Meyer in 1983. The race Monday came a year after a devastating terrorist attack killed three people and wounded more than 260 others, competitors and spectators alike at the 2013 race. 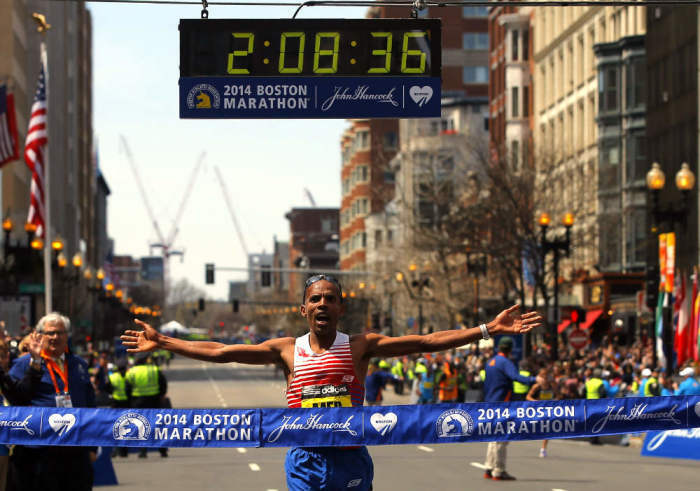 Keflezighi, who finished behind women's champ Rita Jeptoo of Kenya, reportedly wore the names of the Boston Marathon bombing victims on his bib. Keflezighi, who has in his Twitter bio the Bible passage Philippians 4:13 ("I Can Do All Things Through Christ Who Strengthens Me! "), escaped war-torn Eritrea with his family in 1987 and emigrated to San Diego, which is where he first became interested in running. He became an American citizen while in high school. He told the Wall Street Journal in 2009, after his New York City Marathon win, that what helped him recover from a near career-ending injury was intensive therapy, "hard work" and "hard prayer." Keflezighi, "like his parents, is a deeply religious Christian," the paper reported. "Though his training schedule doesn't always allow him to make it to church every Sunday, he makes time for prayer 'every day before I go to sleep and every day before I get up.'" The 38-year-old athlete has said of himself, "My God-given talent was discovering when I could run 5:20. Not everyone can run 5:20. ... I was definitely gifted, but I have to work hard." Keflezighi, whose first name reportedly means "let there be light," shares his testimony in the 2010 book Run to Overcome: The Inspiring Story of an American Champion's Long-Distance Quest to Achieve a Big Dream. According to his bio from Tyndale House Publishers, Keflezighi lives in Mammoth Lakes, Calif., with his wife, Yordanos, and their three daughters, Sara, Fiyori and Yohana. The two men responsible for 2013 Boston Marathon attack, brothers Tamerlan Tsarnaev and Dzhokhar Tsarnaev, carried out the assault to retaliate for U.S. wars in Muslim countries, according to prosecutors. While Tamerlan died in a violent confrontation with police just days after the bombings, Dzhokhar was in custody and awaiting trial.